The production of cattle for the tropics had its genesis in the 1930s when RB Kelley established that zebu cattle had much to offer the Australian beef industry. It culminated with the development of the Belmont Red breed by Jim Rendel and Greig Turner from the Division of Animal Genetics at the National Cattle Breeding Station, ‘Belmont’, north of Rockhampton. The Belmont Red was developed by crossing Afrikaner cattle, imported from America, with Herefords and Shorthorns in a research program that extended over the 1950s and 1960s. It had many remarkable characteristics which suit it to the harsh environment of northern Australia and which ensured its acceptance by the industry. In 1972 the first CSIRO-bred Belmont Red bulls were released for cooperative evaluation to a cattleman with a property near Rockhampton. The bulls, which were two years old, had been deliberately subjected to tough conditions since birth. They had been exposed to cattle ticks and had grazed pastures which for much of the year had little nutritional value. They were scrawny and poorly grown. The cattleman loaded them on his truck and drove straight home embarrassed to be associated with such scrawny animals. He herded the bulls into a remote paddock, away from visitors’ sight, and for the next nine months he constantly reminded the manager of the ‘Belmont’ station of their poor appearance. Then the bulls’ first calves were born. At weaning, they averaged 10 kilograms heavier than the calves of the cattleman’s other stock. The two main British breeds of cattle in northern Australia, the Shorthorn and the Hereford, and mixtures of the two, breed well under favourable conditions, but they are susceptible to stresses imposed by high temperatures, tick infestation and internal worm parasites. They also lose weight on pastures when the protein content of the feed falls below five per cent. For these reasons, British breeds do not generally grow as well in the tropics as they do in the temperate climates to which they are adapted. On the other hand, the humped cattle of Asia and Africa, known collectively as zebus, are well adapted to tropical conditions. In the early 1930s, the CSIR Division of Animal Health, under its first Chief, John Gilruth, decided to investigate the potential of zebu cattle for northern Australia. Much of the push for this work came from geneticist RB Kelley, who went to the United States to select suitable breeding stock. He selected 18 American Brahmans (9 bulls and 9 cows) and one Santa Gertrudis bull for importation. These animals were scattered on five commercial properties throughout northern Queensland with the cooperation of State authorities and cattlemen. Every year for 10 years, Kelley visited the trial properties, watching the cattle’s progress and making copious notes. By 1943 when he wrote his final report, he had convincing evidence that zebus could be of great value to Australia’s beef industry. Between 1950 and 1954 a further 15 bulls and 16 cows of the American Brahman breed and fairly large numbers of Santa Gertrudis were imported. At the same time 8 bulls and 2 cows of another zebu breed, the Afrikaner, were imported for use alongside Brahmans at ‘Belmont’. ‘Belmont’, a 3 600-hectare property on the Fitzroy River, had been bought by the Australian Meat Board in 1952 to provide facilities for studying the breeding of beef cattle adapted to the northern Australian environment. From 1953 ‘Belmont’ was managed on behalf of the Meat Board by CSIRO and operated as a research station. One evening in Melbourne, during an adjourned CSIRO Executive meeting, the Chairman, Sir Ian Clunies Ross, sat down with Dr Jim Rendel and mapped out the future of ‘Belmont’ and its breeding program which Rendel directed. Rendel had trained with the famous English geneticist JBS Haldane and was recruited in 1951 by the Chairman of CSIRO, Sir Ian Clunies Ross. His role was to set up a CSIRO group at the University of Sydney to teach animal genetics in both the Science and Veterinary Science Faculties and to develop and supervise a program of research into animal breeding methods encompassing the domestic fowl, sheep, dairy and beef cattle. Cattle breeding was Rendel’s passion and he was interested in how genes worked in the animal. In time the Genetics Section grew in size and responsibilities and was made an independent Division of Animal Genetics, in 1959 with Rendel as Chief. The Belmont program, which was essentially a long-term one, began with an original stock of imported American Brahmans and Afrikaners, together with Herefords and Shorthorns from Queensland. From this stock, three main crossbred lines were developed: Afrikaner/British, Brahman/British and Shorthorn/Hereford. The Shorthorn/Hereford turned out to be better in some respects than either of its parent breeds and was adopted as the British breed standard for comparing zebu-cross lines. First cross animals were produced from 1954 to 1960 with numbers gradually building up. Likewise, the second generation was gradually accumulated from 1957 to 1964. In the production and mating of these generations a policy of no selection was practised quite deliberately. It was only in the third generation, when the parental characters had been well stirred to provide a richly stocked genetic pool in which to fish, that selection began. The first small matings of selected animals were therefore not made until 1966, with all the emphasis being placed on performance, not looks. Recognised breeds are pre-packed parcels of genes with a trademark. But we didn’t have any interest at all in a trademark. We were not concerned, as is virtually everyone who sets out to make a breed, to make it look like a breed, to get a white face, or the right shape of horns. We ignored these things completely. We were able to concentrate all our selection on fertility, growth rate, and resistance to ticks and heat. By 1968 the first fruits of selection among the third generation began to emerge. Even at that stage it was apparent that the Afrikaner/British line, now known as the Belmont Red, was going to be a winner. Eight bulls, surplus to requirements and carefully tested for fertility and growth, were sold at auction that year and averaged $900 each. 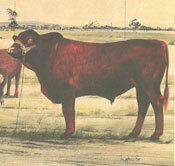 The Belmont Red can be regarded as approximately one-half Afrikaner, one-quarter Shorthorn and one-quarter Hereford. From its zebu antecedents it has inherited its capacity to withstand the stresses of the northern environment while from its British ancestors it has inherited its fertility and its ability to turn grass into meat. The Brahman/British line was also promising. It has a fine edge over the Belmont Red in heat tolerance and tick resistance, while its resistance to intestinal worms is superior. In growth rate, too, it was comparable, but its fertility left a lot to be desired and it had a less placid temperament. The Belmont Red won admirers in many and varied ways. On a big Gulf of Carpentaria property cows of British stock were dropping their offspring in open paddocks at night and then walking to tree-lined water at sun-up, leaving their shaky calves to die in the heat. In contrast, when Belmont Reds were introduced their hours-old calves got to their feet and safely followed their mothers to water. Belmont Reds are also even-tempered creatures, unlike Brahmans which need constant handling to remain tractable. A station manager at Walloon has given them their most glowing character reference. They are the nicest cattle I’ve ever had to handle. I could run this property practically single-handed with Belmont Reds. Henry Greig Turner led the cattle-breeding work at Rockhampton after Jim Rendel. He was a very clear thinker, did much important work on the nexus between adaptation and productivity in the tropics, and led the development of an internationally recognised tropical cattle research centre. Turner was ably followed by John Vercoe. Both are examples of capable scientists who did not consider that good work had to be done in a metropolitan centre; without their kind, the cattle industry in northern Australia could not have become the success it is today, nor could there have been continuity in the more basic work on mechanisms of heat tolerance, tick resistance and other important traits. The Australian Academy of Technological Sciences and Engineering identified CSIRO’s tropical beef breeding as one of the major successes in agricultural technology in Australia’s first 200 years of European settlement (AATSE 1988). McKay A, 1976, ‘Cattle for the tropics’, In: Surprise and Enterprise, Fifty Years of Science for Australia, White F, Kimpton D (eds), CSIRO Publishing, pp.34-35.